During my morning Bible time, I usually read a chapter from Proverbs. A couple of months ago, I decided to be more focused in my reading. Every time I came to a verse that talked about a fool, I wrote it down in my journal. I wanted to see what it said a fool did – or didn’t do – so that I could hopefully avoid being one! While I knew that Proverbs talked a lot about fools, I didn’t actually realize how much until I did this exercise. I found it helpful, and thought I would share some of what I found with you – since I’m sure you don’t want to be a fool either! 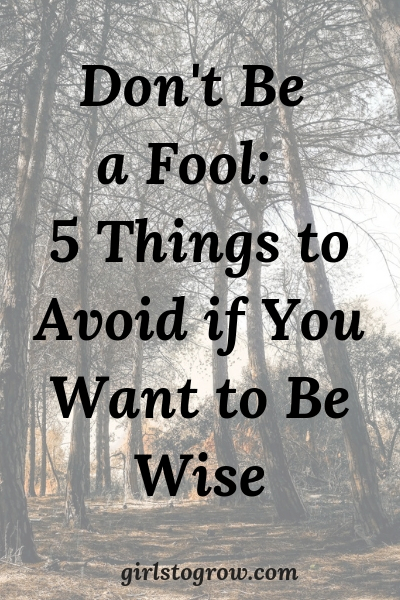 So here are five things to avoid if you want to be not foolish, but wise. 1. Take advice or correction from no one. We get this first one right out of the gate, in Proverbs 1:7. This makes perfect sense. How can you avoid foolishness if you won’t listen to wisdom? Proverbs 1:22 says something similar. Wise people recognize that there are many situations in life that they don’t know how to handle. God’s Word is our first resource in those cases. Beyond that, look for wise advice from other people. Hopefully your pastor could be a help here. In marriage or parenting, ask counsel from someone who’s ahead of you in the journey, and seems to be living in a Christ-like way. It’s only the foolish who think they’ve got it all under control, and don’t want to glean wisdom from anyone else. 2. Talk a lot about anything and everything. Later on, I’d like to write a post on the verses in Proverbs that talk about the fool’s mouth. But for now, here are a few examples. I like the use of the word “poureth.” A fool’s mouth doesn’t just trickle out foolishness; it comes gushing out. And we know from Proverbs 18:7 that it’s not helpful words we’re talking about. We all know that our tongue can get us in a world of trouble. Sometimes we can be wise just by keeping our mouth closed. 3. Enjoy your pet sins. A fool wants to hang on to his sin. He sins without regret or remorse, even finds pleasure in it. If we want to be wise, how tender our hearts need to be in asking the Holy Spirit to reveal sin in our lives. Then we can ask forgiveness, and seek God’s strength to overcome it. 4. Have a short fuse. In other words, get angry quickly. Haven’t we all fallen into this trap? We lose our temper, and then we say or do something really stupid. It can be with a co-worker, our spouse, or one of our children. Proverbs 12:16 addresses this, too. If everybody around you knows when you’re angry, it might be time to work on some self-control. (Preaching to myself here for sure!) We need the Holy Spirit’s help to have self-control, which I think we’d all agree is the mark of a wise person. This kind of goes along with number one. If you refuse to accept instruction from others, you qualify as proud. But look what it says in Proverbs 14:16. I love that we read in James 4:6 that God resists the proud, but gives grace to the humble. A wise man knows he is weak, but goes to God for discernment and strength to overcome his weakness. Maybe we can all take what I learned about a fool from Proverbs, and make decisions in our lives that will cause us to be wise! Oh, my personality as a perfectionist is that I’m always right…which obviously isn’t true!! I certainly need to work on accepting correction graciously, outside and inside, too! I like how you study Proverbs! You’ve learned some neat things, and I appreciate your sharing them with us!